Video Games: From Pixels To The Silver Screen, Is It Finally Working? - GeekForce | Experience The Power Of The Geek! With the rise of the popularity of video games since the 80’s, Hollywood has jumped on the band wagon and tried to successfully, and in most cases unsuccessfully, to adapt them into movies. There were films based on the video game genre such as Tron and The Last Starfighter, but nothing of an actual video game character being brought to life into a film. 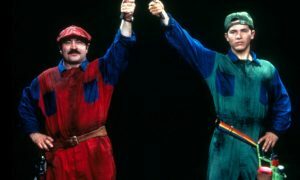 One of the biggest video game characters created, Mario, was given the opportunity in Super Mario Bros the movie in 1993 and despite its huge budget it was perhaps one of the biggest movie flops of all time. Street Fighter was released in 1994; the ever-popular arcade game will always be overshadowed by its movie adaption and terrible script; to this day I still don’t understand the story. Then Mortal Kombat was given its place on the silver screen a year later in 1995, and again poor casting and acting reduced this film to the bargain bucket of many a Blockbuster (before they went broke). Nearly a decade had passed and many Hollywood studios were licking their wounds and the world sighed with anguish at the latest announcement of a video game adaption, the film was Tomb Raider. The Tomb Raider video game was released in 1996 to much critical acclaim; the game sold over 7.5 million copies and would serve as the model for future action-adventure games. 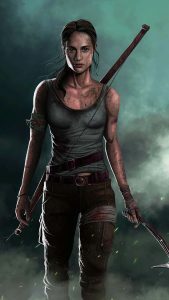 The heroine of the game was Lara Croft, and designed in mind for every adolescent male teenager’s ideal girl, heavily endowed, athletic, sultry looks and wore very tight clothing. But who could play this heroine in the films? Rhona Mitra was heavily discussed being the game developers ‘muse’ during development, Demi Moore was also in the running due to her similarities in appearance with the designed Lara Croft, but it was Angelina Jolie who received the part to much joy from every teenage boy worldwide. The film itself, although not terrible, wasn’t exactly a masterpiece either but nor was it trying to be, it took twice back its original budget which gave Tomb Raider the green light for a sequel (The Cradle of Life) in 2003, again starring Jolie as the titular character. need the back stories to every character introduced. With the rise of zombie inspired TV and films this slotted in in seamlessly and even excelled in some areas. Another film that came to the cinema in the summer of 2016 was Assassins Creed. Like Tomb Raider it has spanned many games and has many diehard fans, and with a cast that included Michael Fassbender in the title role and Marillion Coultilard expectation was high. Unfortunately reviews were mostly scathing although it is arguably better made than most video game adaptations – which is sort of a backhanded compliment. picked up a joypad in their life, and hoped the movie would ride on the popularity of the video game. The same can be said with Mortal Kombat and Street Fighter, there wasn’t really a story behind the games so the writers were ‘let loose’ and without researching in depth they probably thought they could write what they wanted. With the advent of the Tomb Raider films the film studios did get savvier and worked with Eidos Entertainment, who created the Tomb Raider games, to bring their ideas to life and to recreate the character on screen. This was the first real collaboration that film studios had with a video Game studio. Many video game companies now have their own film studio departments. The recent film adaption of the popular MMORPG, Warcraft, had Blizzard Entertainment on the forefront when creating the film. I have seen the film, and by no means am I film reviewer, and I felt it wasn’t bad and actually enjoyed it. As a sporadic player of the game I feel Blizzard have done a good job in realising the Warcraft World on the big screen, although they have struggled to draw in non-gamers, they have turned over their budget four fold since the release, going to show how strong video game adapted films can be if done right. The latest incarnation of the video game movie is the reboot of Tomb Raider starring Alicia Vikander as Lara Croft and based on the 2013 version of the game. Reviews have been mixed and the film has struggled to break even although Vikander’s performance has been praised.